Whats everyones thoughts or experience on tinted tail lights? I have been looking at some aftermarket LED taillights such as the osram ones etc. But until I get round to buying new units im thinking about tinting them but I am concerned about the amount of light let through. For anyone who has them, What shade do you have? How badly does it reduce light? For anyone who doesnt have them, do you think they are tacky or? I have seen some cars with horrible jobs done and look terrible. On the flip side ive seen alot of cars which look awesome with smoked lights. I've had both LED aftermarket ones and tinted my own (b6 but same difference), LED light output is better but they do look a bit aftermarket if you know they're aftermarket if that makes sense and they don't tend to last more than a couple years without flickering but I really did like mine so haters gonna hate. Tinting them yourself is pretty straightforward, blacker the better in my books so I did a fair few coats on eBay light tint followed by lacquer to make them glossy and the light output isn't too bad although the reverse light doesn't seem to shine all that bright now. The rear light brightness can also be set in vag com to make it brighter I believe but I haven't got around to playing with that yet. If i were to get them tinted I would use tint film wrap myself Jake, id of thought tint film would have better properties in allowing light out out aswel as looking dark? I remember when everyone was sticking black tights over there lights lol anyone still do this? Im not entirely sure matey, i have the guy on instagram I have seen many similiar but I dont know if its the editing or what that makes them look great. I know his headlights are the best aftermarket ive ever seen and they are Osram, i wouldn't be surprised if these were the same. Osram headlights are selling for 700 quid on Amazon so not cheap!! A very subtle smoke, I don’t mind. It’s when it’s so dark, and almost indistinguishable from the actual surrounding bodywork, and the brake lights are difficult to make out in bright sunlight, that I have issues. If you would mate please, with lights on too! Yeah thats what im wanting. I find the fully black tint and slight faint red glow from the brakes make the car look cheaply modified. I have seen many newer cars with the new led tailights that look great. My worry is that because i have halogens, it may look terrible! I may try to swap in some LEDs to see how they change, if i go ahead and tint them. As to whether or not brake lights shine through I'd more say that's to do with the stuff that's used rather than how dark or light the rear lights have been done. 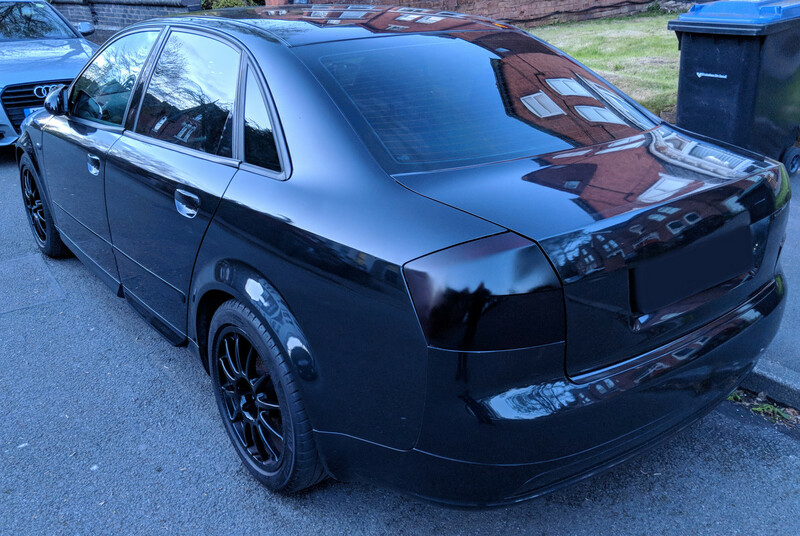 My friend sprayed his headlights black with regular black car paint and then tried to make up for this with HID's needless to say the light output was still rubbish where as I've smoked the rear lights with stuff designed for lights and the output is still alright. Thought you would be the last person to comment on what people should/shouldn't do to their car's anyway haha. Thought you would be the last person to comment on what people should/shouldn't do to their car's anyway haha. You’re getting it completely wrong, Jake. I never said people shouldn’t tint their tails. I merely stated how I found it. As for what I do to my cars, I’ve had comments, some positive, some negative. I take it all in my stride, though. These look fine to me, and are these wrapped? I want them not to look blacked out, but so the red colour isnt as prominent! Got the spray painter to flick some black over the lights. Been two years now and no fading!